Small admission fee is charges except for persons with tribal enrollment card. Children 6 and under free. The facility is located just 7 miles East of Fort Pierre on historic Highway 1806 which follows the Missouri River. The expansive site recalls the ancient prairies on which huge buffalo herds lived. The new center is located on the western edge of a large pasture and is oriented so that the tribe's buffalo graze there in close viewing range. Within the building, exhibits teach about the importance of the buffalo to Native Americans, while large windows maintain a visual connection to the herd and the landscape. 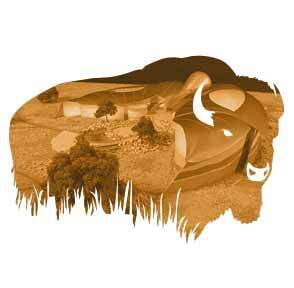 The Lower Brule Sioux Tribe has three bison pastures (units); the Buffalo Center overlooks the Cherry Ranch Unit. The Tribe maintains a herd of 300 bison on 6200 acres. Members of the Lower Brule Sioux Tribe operate the Interpretive Center and items in the gift shop are made by Native American artisans. AmerIndian Design designed the center.